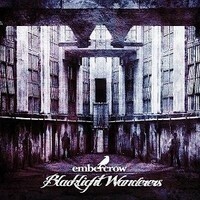 For some years, the so called Gothic Metal (a wrong label used by some bands, but it’s a story for another day) stayed in great evidence, but by now, only a few bands insist to do something in this way, but even with all difficulties, the German quartet EMBERCROW comes with their first album, “Blacklight Wanderers”. Elegant, clean, not aggressive and so heavy, but melancholic and depressive, their work really is fine and good, but it’s nothing really new and that some other well-known bands as KATATONIA and ANATHEMA didn’t have done yet. But there’s no lack of personality here, please. It’s not bad, but it could be far better than we hear here. But let’s consider it’s their first album as well. Having Robert Franz producing and mixing the album, with Tom Meyer doing the mastering work; it sound very clear and in a good level of quality, but the guitar could have a better sound in some moments. The artwork, done by Jakob Gozdzielewski, is fine and simple. Not a complicated art, but it’s good as it is. The greater moments: the long and melancholic “In Search of the Sun” (some good riffs here, but sometimes the vocals do not fit as they must), “The Eye Haunting Me” (good keyboards arrangements and clean guitars), the middle clean and middle hard “Isle of Origins” (with some guttural voices fitting very well to the song, as the clean ones), the elegant “Vagrant Moon” (this song reminds us all of something from AMORPHIS’ work), and “The Eternal Dialogue”. By the way, it’s not because I said the guttural voices fits well that the vocalist can’t sing with clean voices, please. And one more thing: their work is not a trivial one, so be aware to stay with open mind to it. With a good chance, they really can become great one day, but need some little improvements in their music. Doing that, it’s good for some great bands from the style to take care with them.